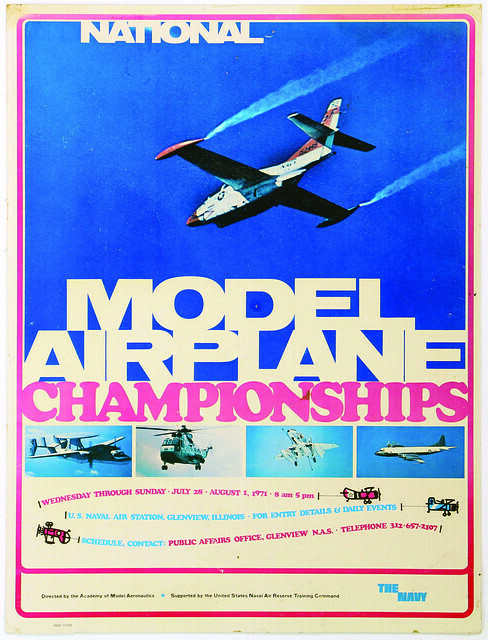 In this month’s “History Preserved,” we’re showing off some of the posters we have in the museum archives that represent the AMA National Championships (Nats) throughout the years. Posters can be art. They can represent the feel and excitement of a time and a place. They can be informational hubs. You can learn a lot from a poster. The 1939 poster not only shows you what activities would be happening—with a model soaring above the Detroit skyline—but much more. It showcases the sponsorship of the National Exchange Club, displays the NAA logo to indicate sanctioning, indicates the featured hotel for Nats (Hotel Fort Shelby), and even describes how to receive an entry blank (“Send Stamp”). Unfortunately, competitors had to go to another source for the mailing address. Posters for the 1940 and 1941 Chicago Nats have more detailed information. Again, a model airplane is shown (an obligatory element), with the hotel (Hotel Sherman) and sponsors (the Chicago Times and the Chicago Park District) indicated, and an NAA logo. This time, the entire schedule is included, with dates, times, and specific events indicated. The competition was billed as “America’s Greatest Junior Air Show!” Admission was free. These posters probably helped draw in big crowds known for attending the early Nats, as well as keep the attendees well informed. Hosted by the U.S. Navy, the 1970 poster showcases the Navy’s participation with the silhouette of an F-4 Phantom and the sun dramatically setting behind it. This poster promoted the models and the Navy, perhaps heavier on the Navy side than the aeromodeling side. The Air Barons giving a free air show was prominently advertised, with the assumed purpose to lure the public. The 1979 Nats poster is our archivist’s favorite. It combines information about the Nats and aeromodeling with a fun representation of the Cornhusker State (Nebraska). The animated corn character appeared on event patches and stickers. A representative alligator advertised the previous year’s Nats in Lake Charles, Louisiana, but we do not have a poster from that year in the collection. In 1983, the Nats were held at the Westover Air Force Base in Massachusetts. A cartoonish version of the base on the poster is reminiscent of an amusement park map, which makes sense because attending the Nats is fun. The year 1996 was when the Nats were first held at the new International Aeromodeling Center in Muncie, Indiana. It’s the first in the collection that promotes the National Model Aviation Museum! The most recent poster we have in the collection is from 2005, the 79th Nats. It has an event schedule, directions, and photos of what you might see in competition—again trying to attract a local audience. We don’t have all of the Nats posters that were created in the archives. We have at least one poster representing the following years: 1939-1941, 1946, 1970-1972, 1977, 1979, 1981-1983, 1985, 1991, 1996, and 2005. We don’t believe anyone created a poster for the 1942 Nats before they were canceled because of World War II. No Nats were held from 1942 to 1945 because of the war. Do you have any Nats posters from the years that are not listed above? If so, consider contacting the museum about them at (765) 287-1256, ext. 511, or email the archivist at jackies@modelaircraft.org.